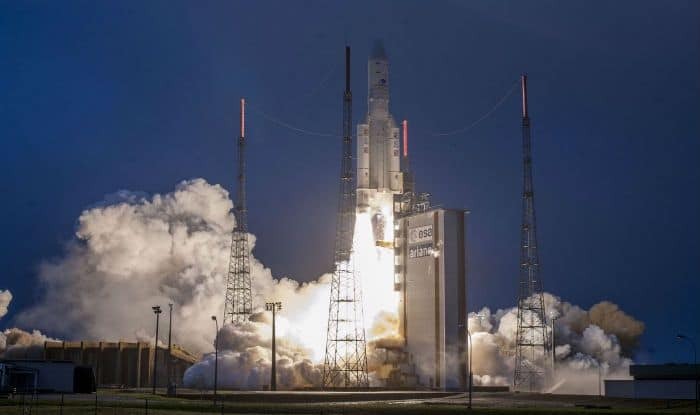 India’s latest communication satellite GSAT-31 was successfully launched by European launch services provider- Arianespace rocket from French Guiana in the early hours of Wednesday. New Delhi: GSAT-31 – India’s latest communication satellite – was successfully launched on board Arianespace rocket from French Guiana during wee hours on Wednesday. GSAT-31 was injected into the orbit by Ariane-5 that blasted off from Ariane Launch Complex at Kourou, a French territory located in northeastern coast of South America at 02:31 am (IST). The flight lasted about 42 minutes. GSAT-31 weighs about 2,535 kg and will provide continuity to operational services on some of the in-orbit satellites. It derives its heritage from ISROs earlier INSAT/GSAT satellite series. The satellite provides Indian mainland and island coverage. According to ISRO, this satellite will augment the Ku-band transponder capacity in Geostationary Orbit. GSAT-31 has a mission life of around 15 years and will be used for supporting VSAT networks, Television uplinks, Digital Satellite News Gathering, DTH-television services, cellular backhaul connectivity and many such applications. The launch of GSAT-30 by Arianespace is also on the cards in the near future. Arianespace had launched India’s APPLE experimental satellite on Ariane Flight L03 in 1981 and since then it has orbited 23 satellites and signed 24 launch contracts with the Indian space agency.